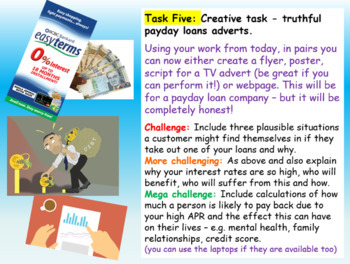 A fully-resourced PSHE lesson all about the risks involved with payday / short-term loans, why so many people are using them and the detrimental effect they can have on people’s lives. 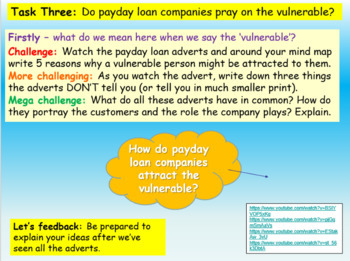 The lesson investigates whether and how payday loan companies target the vulnerable and exactly how interest can mount up to be unmanageable in a short amount of time. 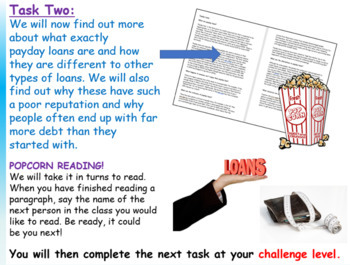 The lesson includes one 1 hour - 90 minute detailed PowerPoint, differentiated challenge activities and worksheets, clips tasks with questions, debate focus task and a creative / group task. These resources have been designed to be engaging, detailed and easy to follow. The lesson has been left editable and is filled with engaging, well differentiated and fun activities.